The Messenger (may Allah bless him and grant him peace) disliked lying on the stomach. The Messenger of Allah (may Allah bless him and grant him peace) would put his blessed right hand under his blessed right cheek. He would lie on his blessed right side facing the Qibla. ‘O Allah (The Exalted) with Your name I die and I live’. Respected brothers/sisters of Islam! Before going to sleep we should think of the sins we may have done and try our best not to do these again, repent and ask for Allah’s guidance. If you want to spend your night in worship then sleep the way our beloved Prophet (may Allah bless him and grant him peace) slept and offer Fajr Salaah with congregation. You will surely gain the reward of worshiping all night even though you were sleeping. 1. One should recite ‘Bismillah’ whilst closing the doors and latching the lock. 2. Containers with foodstuff including water should be covered with the recitation of ‘Bismillah’. 3. To put out any burning fire i.e. candles, fireplace etc..
4. To switch off or put out anything that may catch alight if left on. 5. To discuss, with members of the household, matters relating to Islam. For example, by telling stories (of Sahabas, etc.) or simply talking about matters that pleases the family but within the confines of Shariah. 6. To have available Surma and apply three times in the right and left eye. 7. It is desirable (Mustahab) to sleep with wudhu the Sunnah way. 9. To lay or spread the bed yourself. 10. 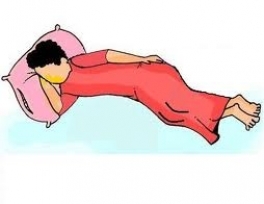 To clean the bed three times with a cloth before sleeping. 11. When a child reaches the age of ten, he must not sleep in the same room as his sister, mother or another woman except his wife. 12. For two men to sleep on one bed or in one blanket is not permissible, it has been prohibited in the hadith. 13. A child of ten must not sleep in the same bed as the husband and wife. 14. The feet should not be facing towards Makkah or Madinah. 15. Before sleeping recite ‘Bismillah’ and the three Quls , and thereafter to blow on the palms and rub three times on one’s entire body ‘ beginning from the head and ending at the toes. 16. To use a pillow is Sunnah (to rest one’s head on). 17. The Messenger (may Allah bless him and grant him peace) disliked lying on the stomach. 18. Do not have your feet facing the Qur’an or other religious books and if the books are higher than the feet there is no problem. 19. To recite any Surah from the Qur’an one remembers, especially Surah Mulk , Surah Sajdah , Surah Bani Israeel and Surah Zumar . 20. To recite Surah Waaqi’ah before sleeping as this safeguards one from hunger and poverty. 21. To recite Tasbih-e-Fatima and Kalimah Tayyab once, before sleeping. 22. To keep a prayer mat for the Tahajjud prayer besides the head is a Sunnah. 23. When going to sleep, remember your grave as you will be sleeping on your own with your deeds and no one will be there with you. 24. Remember Allah (The Exalted) because the state a person sleeps in is the state in which one will wake up. 25. Do not sleep after ‘Asr as there is a chance of loosing the intellect and it is disliked (Makrooh) to sleep in the beginning part of the morning and between Maghrib and Isha.